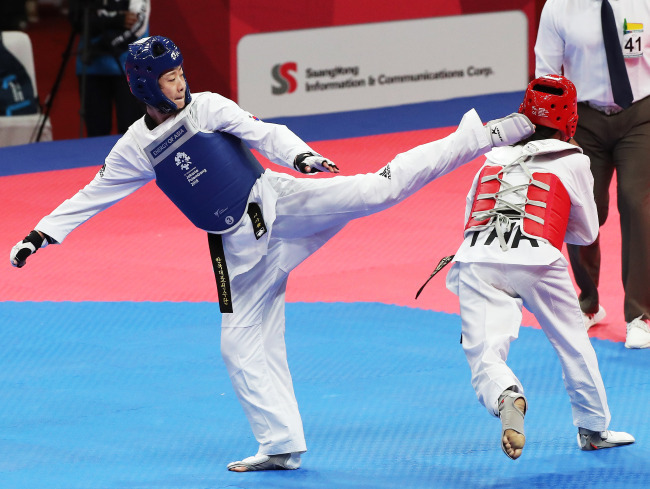 South Korean taekwondo fighter Lee Ah-reum has decided not to take part in an upcoming international competition following an incident in which she was caught driving while intoxicated, the Korea Taekwondo Association said Monday. KTA said Lee will not participate in the 2018 World Taekwondo 3rd Grand Prix in Taoyuan, Chinese Taipei, which will be held from Wednesday to Friday. KTA previously included Lee on the 15-member roster and allowed her to compete in the 57-kilogram division. But after Lee's inclusion sparked controversy last week, KTA reportedly notified the WT that the 26-year-old will not compete in the Grand Prix due to treatment for ankylosing spondylitis, a type of arthritis that causes pain and stiffness in the spine. WT Grand Prix is considered an important competition for taekwondo fighters because it gives them an opportunity to win ranking points that can allow them to earn automatic qualification for the Olympics. Withdrawing from the competition without proper reason after receiving an invitation may result in a taekwondo fighter being banned from competing in the next WT Grand Prix. KTA said Lee told the officials that she will not compete and will take time for self reflection. Lee, who won a gold medal at 2014 Incheon Asian Games and a silver medal at the 2018 Jakarta-Palembang Asian Games, was caught driving under the influence in Suwon, south of Seoul, on Aug. 28. Local police said she had a 0.151 percent blood alcohol level. The prosecutors are currently reviewing the case to decide if she will be indicted. Critics said Lee should have withdrawn from the competition immediately after the drunk driving incident. Although it is true that Lee is suffering from ankylosing spondylitis, it has been months since she received treatment and pulling out just days before the competition is questionable, they said.